It’s time for the new quarterly IHG hotel promotion! I recently discussed How to Maximize the IHG Accelerate Promotion by calculating whether or not it makes sense to take part in the promotion and if it lines up with our travel plans. It’s already time to register for the next promotion and walk through how to calculate the point at which the promotion earns the most value. 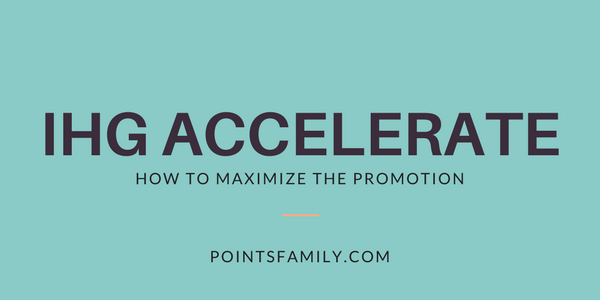 Completing the entire promotion isn’t usually the most lucrative option. The IHG accelerate promotion is specifically targeted to each person. Register for the IHG Accelerate Q2 promotion to get your offer. The Q2 accelerate offer runs between May 15, 2017 and August 31, 2017. 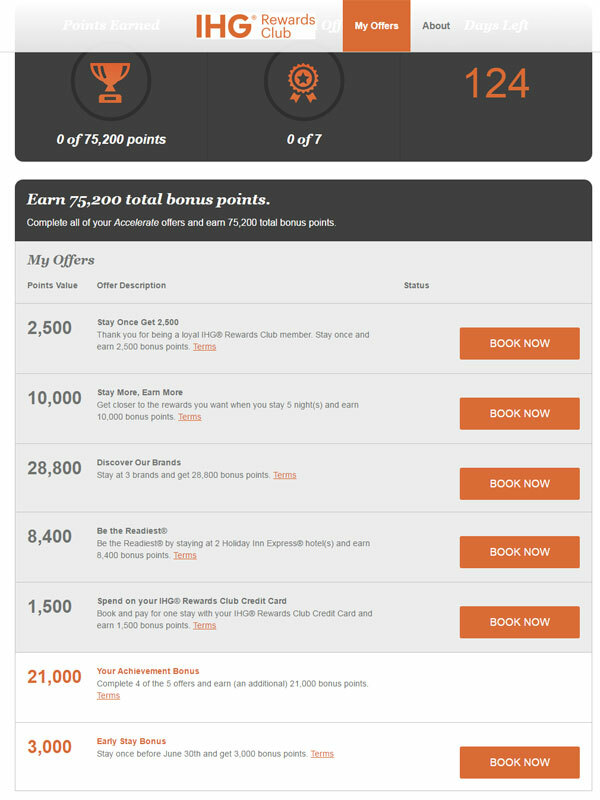 I could stay 5 nights to complete the full offer for 75,200 points. 5 nights at an average cost of $100 per night would mean 75,200 points at an outlay of $500. If I actually needed 5 nights somewhere, it would be about break even. *To get the value of the 3rd night, I had to calculate 2 options. Option A is 2 nights at a Holiday Inn Express, Option B is 3 nights at 3 different brands. The third night is the difference between the two options. And the fourth night is the incremental value of completing both of those! When you lay it out this way, the value in this offer is in completing 3 or 4 nights to maximize the offer. If I aim for $100 per night (although I expect it to be a bit more if we line it up with our summer vacation plans), we’ll earn another 6000-8000 for 3 or 4 nights, plus about 1000 for the credit card use for one night. Total projected earnings for three nights: 42,800 points (3 nights) or 74,200 (4 nights). If I redeem the points for points breaks hotel nights at 5,000 each, I’ve earned 8-16 free nights! Using a median value (from Hotel Hustle) of 0.559 per point the value of the points earned is $239-$414. Take the Best Offer. I register both my husband and myself and pick the better offer. Chase IHG Credit Card. I used the Chase IHG credit card to complete our offer. After the sign up bonus, I kept the card open since it provides a free night each year after you pay the $49 annual fee. The Chase 5/24 rule doesn’t apply to the IHG card. What is the most lucrative combination to maximize your IHG accelerate promotion this quarter?